When does the ticket sale for Defqon.1 start? Our travel packages will be available at Coretours.se. Since we are an official partner are we allowed to start selling our travel packages earlier. Make sure to be there in time and book your ticket. Last years edition of Defqon.1 was sold out quickly. Coretours expect to sell out within a few days. Be sure to book in time to avoid disappointment. How much does the tour with Coretours cost? How do I get the entrance ticket after I have booked through Coretours? From 2018 does Q-dance and Paylogic send out mail with a download link after you have registered your account and personalized your tickets. If I am from Denmark/Norway, where do I order my tour then? 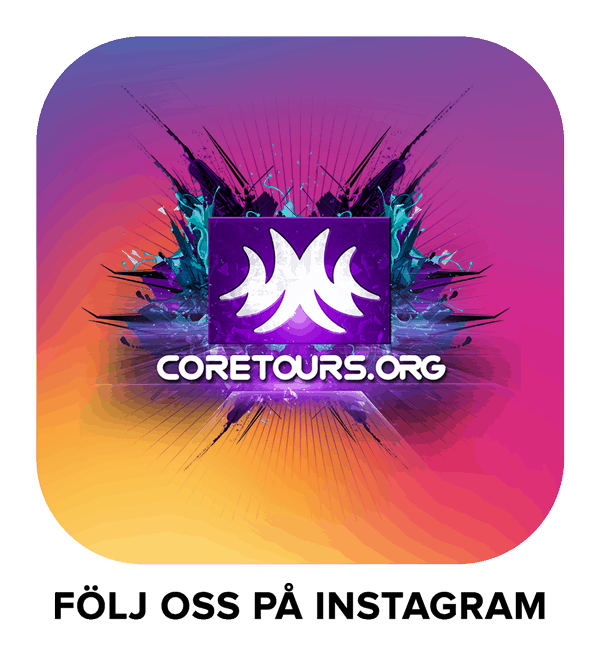 You order the tour on Coretours.se, don’t worry most of all information is available in English. You place your order under the ”Tickets” menu and then you choose you Defqon package. Are you an official partner with Q-dance? I’m gonna book for my friends as well, what information do you need? From Coretours.se -> Tickets, then choose the travel package you want. Is it possible to pre-book/reserve the Defqon.1 tour? Unfortunately not, we don’t allow pre-booking/reserve for our Defqon.1 tour. We follow our terms of agreements with Q-dance strictly. No exceptions are made! Are your tickets from second hand market? No, all of our tickets come directly from our partner Q-dance. Where can I read more information about your tour? All information about Defqon.1 is updated on Coretours webpage. As soon more information is announced by Q-dance – we publish it there. I really, really want a ticket! How can I be sure to get one? First of all be sure to save up a Defqon.1 cash bag, put some extra money aside from your work, birthday etc so it doesn’t come as a shock when we release our package. Last years edition from Q-dance was sold out very quickly. To avoid disappointment be sure to book your tour with us as soon our booking opens. I want to book a deluxe comfort package at Q-dance.com, can I still book only travel with you? Yes, it’s no problem, visit the Ticket/shop section and choose the product named ”Bus only”. Which date do you recommend to take off from work? We recommend 22th to 28th of June! You are gonna be very, very tired, it’s party nonstop from Friday to Monday morning. So for your own best, take off between 22-28th of June. Note that this is just a recommendation. Which pickup points will be available this year? You find all available spots to the left on Coretours event page. Cities marked with italic and * is only available if enough big group is traveling from those points. In case of a low attendance, pickup will be changed to the closest available. I only want to buy a ticket, is it possible? At the moment we only offer two types: Complete package with tour and weekend ticket together and Bus tour only. Can I buy a Defqon.1 tent down there if I want one? Of course, there is a special shop close to where we camp where you can buy the official Defqon.1. If you book a tour with Coretours then they have special tent packages as well. I wanna stay up to date with updates about Defqon.1 , where should I look? We recommend you to like our Facebook page, sign-up for our newsletter above (in the sliders right-down corner) and to join our event page as well on Facebook, by choosing to follow us/receive notifications will do so you don’t miss any important updates about Defqon.1. Visit Coretours to see the dates. How many tickets can I book per order? A maximum of 9 tickets including tour is allowed. Note that reselling for a higher profit is not allowed either sale to second-hand market. Abuse of ticket scalping will lead to a permanent ban from further tours and no refunds will be made. What does the camping look like? Check all picture in the menu of this website. Is it possible to camp at Coretours camp without traveling with Coretours? It is not possible. The only way to camp at Coretours camp is to book a travel package through Coretours. Can I leave the festival and camping area and still get back in? With a weekend ticket – Yes! However, you need to go through security check again but that only takes around 30 seconds. Normally the security guards aren’t harsh if you bring some good home-baked bread from a grandmother with Nutella. However, they won’t allow you to get in with a fridge full of food. Yes, you are allowed to bring alcohol to the camping site, but there is a limit to bring drinks: a maximum of 4,5 liters for soft drinks and drinks that contain less than 14,5% alcohol. Glassware and liquors are prohibited. Alcohol is also available in the camping stores and bars 24/7. It’s allowed to take medication with you, but the medication needs to be in the original and sealed package. You also need to bring a medical certificate. 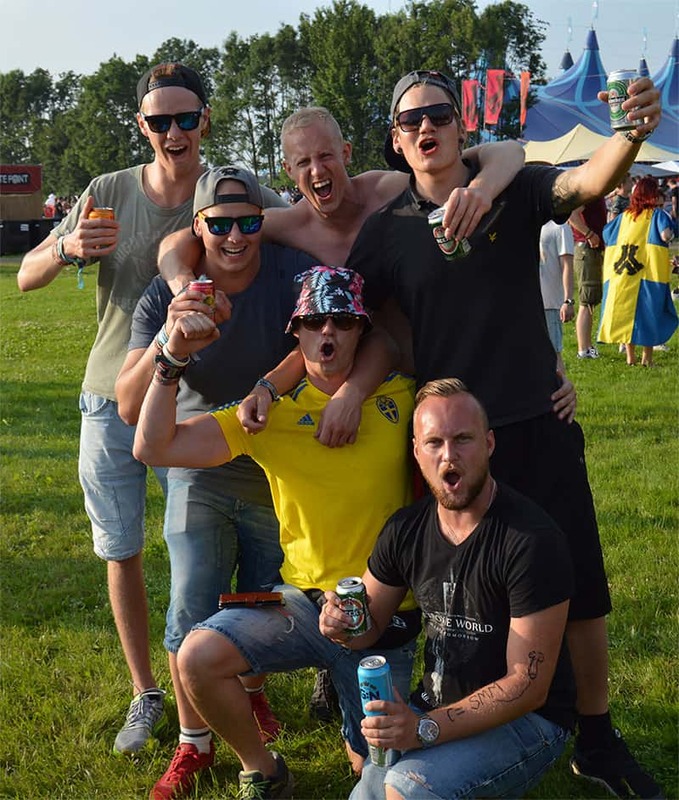 Which time are the buses arriving and leaving Defqon.1? Around 1h before Defqon.1 camping opens preliminary are we arriving if everything goes as planned. The time the bus leave is different every year. Visit Coretours event page to read more about the departure. If you have booked an accommodation from Q-dance be sure to have checked out in good time so you don’t miss the bus because of ques etc. Is it possible to rent a locker? Yes, renting a locker on the Defqon.1 Camping Ground for three/four days costs €18,-. A locker on the Camping Ground for two days costs €13,-. A locker on the Camping Ground for just one day costs €7,-. Are there any showers in the camping area? Yes, there are several showers and the Coretours Camp is located right next to one. The showers at the Defqon.1 Camping Ground is available 24 hours a day. Each time you use a shower, it will cost you one token. The shower house has limited electricity, meaning that you are able to use electricity for a short amount of time. Yes, using electricity for your shavers and hair dryers is possible in the shower compounds. It’s possible to get a mobile charger on the Camping Ground. If you travel with Coretours then their own camp has full electricity sockets with 230V. Is the Coretours bus parked far from the camping/festival? We have a perfect parking only 1-2 min away from the entrance so you don’t need to hassle with your stuff. Is there anything else to do close to Defqon.1? Actually, a big amusement park named Walibi is just a 5 min walk away! It futures some really cool Roller Coasters and other attractions as well. Normally they have a good deal for all Defqon.1 party people. You can read more about the amusement park HERE. Didn’t find the answer to your question? 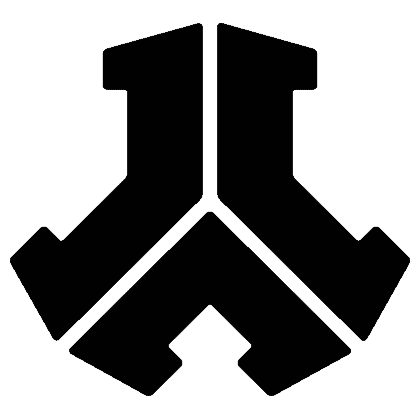 Visit Defqon.1 official website or contact us with our contact form.